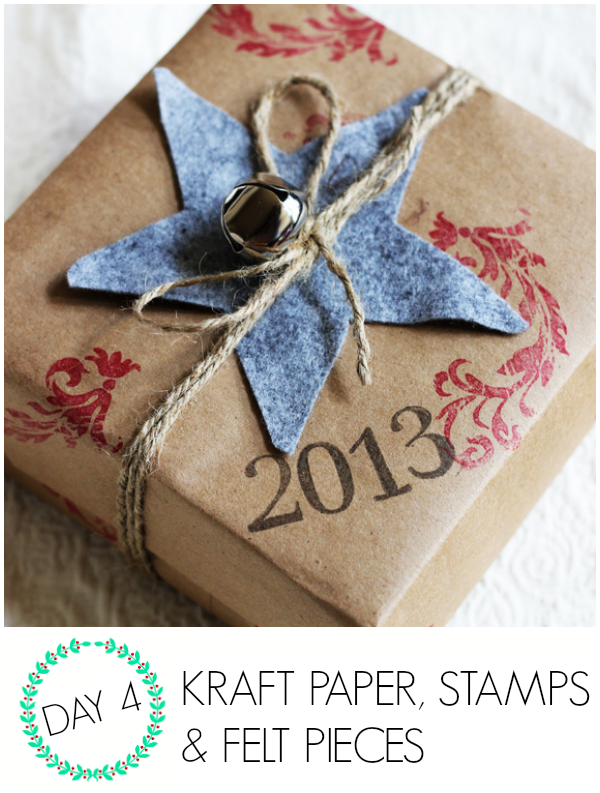 Wrap it Up #7: Kraft paper and stamp gift wrap - C.R.A.F.T. It’s the 4th day of the Wrap It Up series, all about unique gift wrapping ideas! If you’re new here, we’ve had dish towel gift wrap, DIY fabric stamped gift wrap, wrapping with a pillow case ideas, fabric scrap bow ties, DIY photo gift wrap, and now sprucing up kraft paper with twine, bells, stamps, and felt cut outs from my cute Austin blogger friend, Amy! Hi, everyone! My name is Amy, and my blogging home is called Positively Splendid. My blog is my own cozy little corner where I chronicle my quest to create something lovely each and every day with my own two hands. I would love for you to stop by for a visit. Trying to keep up with different rolls of wrapping paper for every occasion used to make me want to pull my hair out until I got smart and realized I could replace each an every one with one easy-to-find supply: kraft paper! Today I am going to share with you how I use stamps to easily update and personalize the paper to make it perfect for wrapping gifts for any recipient. To begin, cut a piece of kraft paper large enough to wrap your gift. Use the stamps and ink pad to randomly stamp images across the surface of the paper. You can even use letter stamps to stamp a specific name or message. Be creative! Allow the ink to dry completely before using the paper to wrap your gift as you would with traditional wrapping paper. Now, finish things off with a flourish by tying a pretty bow with twine. 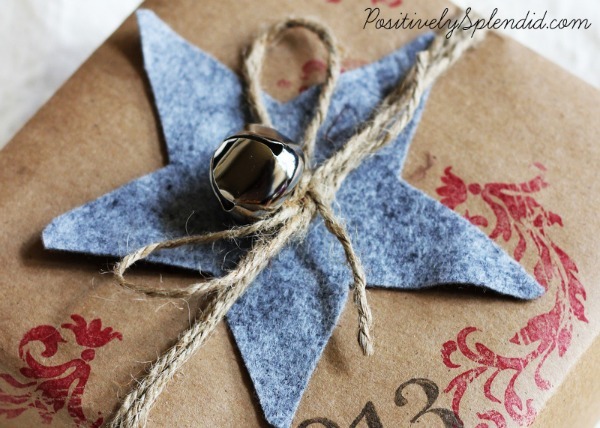 One easy, inexpensive way to embellish gifts is with simple, handmade felt cutouts, like the star I used here. I also love to add a jingle bell or two for a festive touch! 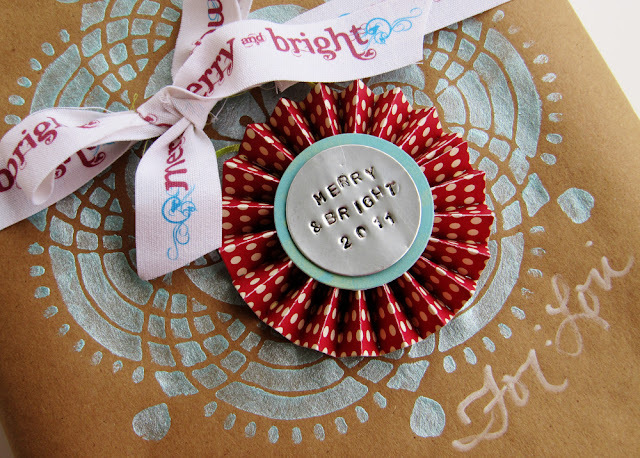 In addition to stamping, using paint and stencils is another great way to punch up kraft paper. Or, for a stylish, reusable gift-wrap option, be sure to take a peek at my drawstring fabric gift bag tutorial. I love making a passel of these at the beginning of December to use all holiday season long! Thanks so much to Jamie for having me over today! I’ll be creating up a storm all season long over at Positively Splendid, so I hope you’ll venture over to say hello sometime!